We love Greek Food but never seem to eat it that often. Over dinner tonight we reminisced about how much we really enjoy it and that we only seem to eat it when we are in Hawaii or Paris – some of favorite Greek restaurants are there. This recipe is fantastic as it brings Greece into your dining room, in under an hour. I used fresh Meyer Lemons and oregano for the marinade; it was incredibly aromatic while sitting out on the counter as well as when cooking. It filled our tiny kitchen with fresh scents of citrus and grilled meat just as it is on the streets of Greece … okay, we have not been to Greece, but we have a feeling this is what it would smell like, as it does in one of our favorite neighborhoods in Paris. Pork Souvlaki is about to become our favorite summertime grilled meals, I cannot wait to try it with lamb. You will love it was well! n a medium bowl, toss the pork strips and onion wedges with the olive oil, lemon juice, chopped oregano, and garlic paste. Season with 1 1/2 teaspoons of salt and 1/2 teaspoon of pepper and let stand for 30 minutes. Meanwhile, in a bowl, mix the yogurt, cucumber, and the mint. Season the tzatziki with salt and pepper. Heat a large cast-iron griddle or grill pan until very hot. Add the pork and onion wedges along with any marinade and cook over high heat, turning once or twice, until the pork and onion are tender about 10 minutes. 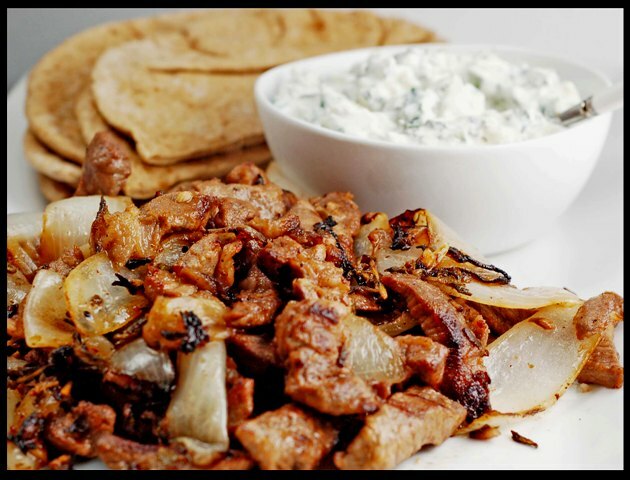 Transfer the pork and onion to plates and serve with the tzatziki and pita. 8 Responses to "Pork Souvlaki"
OMG. I loooove souvlaki. Somehow, it never occurs to me to make it. I used to live across the street from a greek pizza place in Boston, the best souvlaki!! Now I have no excuse not to make it at home! Thanks. Here, here...nice to see some souvlaki recipes floating around the 'net. Next time...try a Greek source for a more authentic recipe (wink-wink).